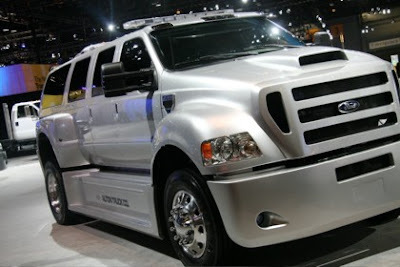 Over-compensation has a new face, and it’s the Ford Alton F-650 XUV. It looks like the child of a semi-truck (18-wheeler) and a Ford pick-up truck, with a bit of armored truck mixed in there as well. To put it simply, the Alton F-650 XUV is the juggernaut of the legal roads. It’s got a price tag of $200,000 and it comes with custom interiors, seats, and tons of tech-gadgets to mess around with. The XUV has three side doors on each side, allowing for optimal load/unload times for passengers (and other crap).